This tour will show you some of the features of Web Confidential. 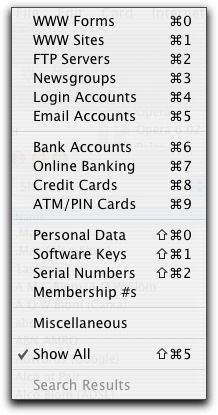 To start, choose New from the File menu to create your password file. You will be presented a document window with a Panther-like toolbar. Please note the Category popup menu in the left and the Search toolbar item on the right. You can create a password in any of fourteen pre-defined categories. You will certainly use the category 'Software Keys' to store the registration keys of the software you own. You will also certainly use the 'ATM/PIN Cards' and 'Online Banking' categories to store your confidential passwords and PIN codes. You will also use the category 'Email Accounts' to store the data of the several Email accounts you have. 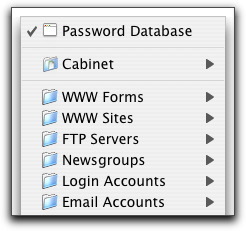 To store the data of your new password item, please select a category and click on the Add toolbar item (the icon with the plus sign on it). Down slides the Enter Sheet that allows you to add the data for this new password item. Let's now assume you need your registration key for Eudora. Just type 'eud' in the Search toolbar item and click Return. Immediately, the search results appear in the List View. Click the search result you want and use the Action menu to easily copy the registration key of this item. 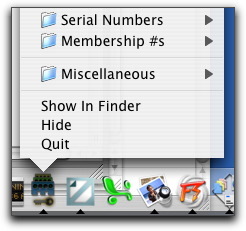 While you are in another application, like Safari, Explorer or Mail, you can Control-Click on the Web Confidential icon in the Dock and you can then use the popup menu to access all your password items. Note also the Cabinet menu item. With this command you can easily open other passwords files you might have in your 'cabinet'. 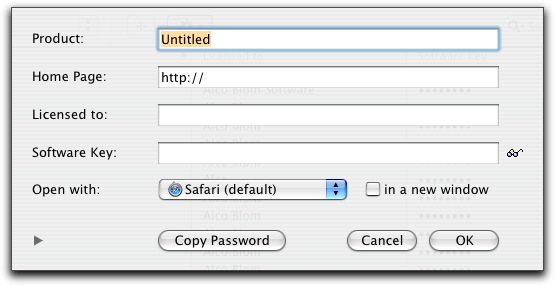 While you are in another application, like Safari, Firefox or Mail you'll also have access to your paswords via the Shared Key Lock menu. 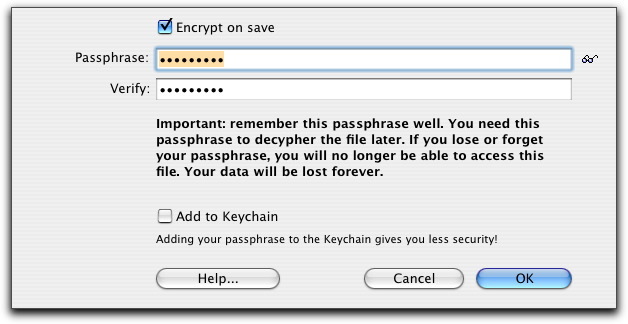 All your passwords in your password file will be protected by one master password: the passphrase. Optionally, you can add your passphrase to the Keychain. You can exchange password files with Web Confidential for Windows, since the file formats on both platforms are binary compatible.